CPCC Theatre presents I Love a Piano: The Music of Irving Berlin Feb 12 through 21 in the Halton Theatre. The amazing cast of six tell the story of the prolific song writer Irving Berlin from the days of Tin Pan Alley to post war America. J. Michael Beech is excited to make his CPCC Theatre debut. I Love a Piano marks J. Michael’s second appearance in a Charlotte, having been seen last year as Pontius Pilate at Theatre Charlotte. From Raleigh, J. Michael currently teaches Theatre Arts, Creative Writing and Film as Literature at East Gaston High School. Favorite roles include Frankie in Forever Plaid (National Tour), Henry Ford in Ragtime and Captain Schultz in Miss Saigon. Kayla Ferguson is really excited to perform in her second show at CPCC. Her previous theatre credits include Chicago (ensemble), Into the Woods (Rapunzel), Les Miserable (Eponine), Little Shop of Horrors (Crystal), as well as performances in Opera. Enjoy the show! Corinne Littlefield is thrilled to be back on the Halton Stage in I Love A Piano. Originally from New Canaan CT, she holds a degree in Theatre and Dance from Franklin & Marshall College in Lancaster PA. Some favorite roles include Nancy in Oliver!, Hedy LaRue in How to Succeed in Business…, Audrey in Little Shop of Horrors, and Maggie Anderson in Brigadoon. She would like to thank her family for their constant love and support. Megan Magden Postle has thoroughly enjoyed performing in four previous CPCC theatre productions over the past year, most recently, The Phantom of the Opera (Wardrobe Assistant/Confidante). A classically trained vocalist, Megan has had the opportunity to perform nationally and internationally in various mediums from opera to pop music. An advocate for music and theatre education, Megan currently serves as Performing Arts Director at Trinity Episcopal School as well as maintaining her own private studio specializing in pre-collegiate training. She would like to thank her husband, Damon and her mom for all their love and support. 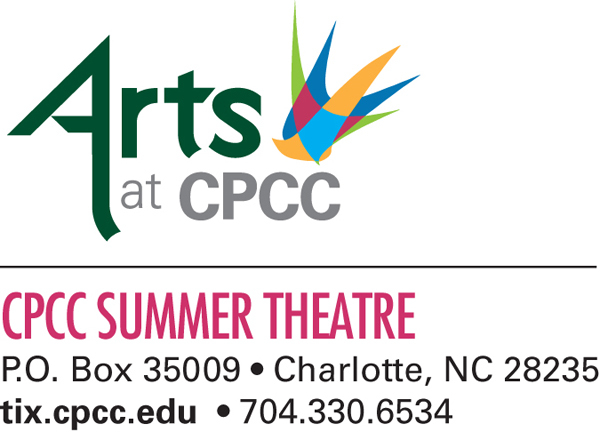 CPCC Summer Theatre will hold auditions for actors, technicians and interns for the summer 2016 season on Saturday February 20th from 9:00am to 4:00pm in the Dale F. Halton Theater by appointment only. Actors and Interns from 14 to 60+ are needed for a season of 5 shows. A separate audition will be held for performers 13 and under on February 22 & 23 at 7:00pm. Paid and Intern technical positions in stage carpentry, stage management, scenic painting, props construction, lighting, wardrobe, running crew and costuming are available. Interviews for tech positions will be held starting at 11:00am. Technicians sign up upon arrival. Call 704-330-6835 to make an appointment starting Feb 1st. Technicians need to bring portfolios and resumes for interviews. Headshots and resumes for actors preferred. Roles are available in all shows. Prepare a song and monologue. No more than 90 seconds for both. 16 bars of music preferred. Be prepared to dance. An accompanist will be provided. No tapes or CD accompaniment allowed. Bring sheet music in the correct key. If auditioning for Sleuth only, all that is required is a monolog. Those auditioning for Sleuth only report at 11:00am or 3:00pm. If you want to be considered for Sleuth and other shows in the season you must make an appointment to sing and attend the dance call. Annie will start rehearsal on April 18th in the evenings Sunday – Thursday until opening. Chicago rehearses day times 9:30a to 4:30p Monday – Saturday starting May 31st until opening. Sleuth and Aladdin Jr. rehearse daytimes 9:30a to 4:30p Monday – Saturday starting June 13th until opening. Sister Act rehearses Monday – Saturday 1:00pm to 4:30pm and 6:00pm to 9:30pm starting June 27th until opening. We are looking for actors to appear in the entire season as well as performers for single shows. You must be available for day time rehearsal to work in all shows except Annie. The performance season runs from May 23rd to July 23rd for actors. Technicians must be available starting May 16th through July 24th. For further info on the Intern program please visit our website at http://blogs.cpcc.edu/theatre/auditions/cpcc-summer-theatre-auditions/intern-auditions/ Intern schedules may vary. Payment for roles varies according to the size and number of roles played during the season. Housing stipends are provided for actors and technicians outside the 10 county Metrolina area who are hired on a seasonal contract. College credit is available for those who qualify. Internships are non-paying. CPCC Summer Theatre is a non-Equity summer stock company presenting a season of musicals and non-musicals to the Metrolina area. 2016 will mark the 43rd anniversary of the company. 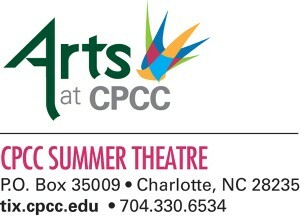 Visit our website at http://blogs.cpcc.edu/theatre/ for more info about the program.